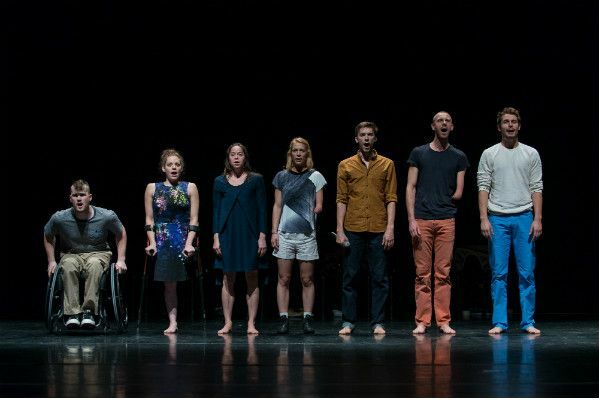 CounterActs: a new double bill of dance from Candoco Dance Company combining mischievous questions and virtuosic performance. Candoco Dance Company, the world’s leading contemporary dance company of disabled and non-disabled performers, has been creating acclaimed and cutting edge work for over twenty years. In this new double bill, Candoco presents commissions from two of the most exciting artistic talents working in the UK today. Visual artist Hetain Patel’s Let’s Talk About Dis is a playful and intimate piece that builds on an exploration of the dancers’ personalities and bodies, interrogating questions of what identity is and how it is formed. With seductive charm, Hetain Patel challenges audiences to think beyond surface appearances, exposing hidden prejudices and absurd political correctness. Alexander Whitley creates visually striking dance pieces, which incorporate sinuous and expressive movement articulations. Set to a mesmerising score by composer Nils Frahm, this is a resonant and emotive piece performed with reckless flair.